With the departure of drumming legend Jayson Sherlock, Rowe saw an opportunity in young drummer Phil Gibson. Gibson's frantic and at times chaotic drumming style inspired Rowe to present a much more raw release in Bloodworld. Tired of the low down Death Metal dirge, Mortification opted for standard tuning and "real" and unprocessed guitar, bass, and drum sounds. Rowe's shouting vocals were presented most strongly on Bloodworld, harking back to his mid 80's Punk Metal band Axis. Bloodworld runs at a frenetic pace through melodic power-riffing and anxious, frantic drumming. Bloodworld has that "live in the studio" sound although being a fully produced, high budget studio album. Bloodworld took Mortification further into the world's Metal scene, with back-to-back tours in Europe and the US taking 50 shows to their hungry fans. The European tour also included a performance at the "With Full Force" Festival in Germany, sharing stage with major acts Napalm Death, Sick of It All, and Entombed. 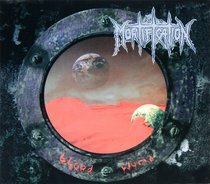 Receiving an encore at the festival showed that Mortification had strongly established their popularity in the German Metal scene.